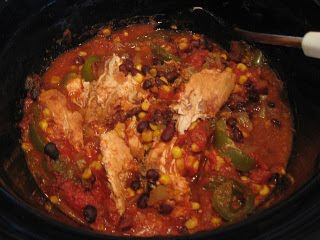 Combine all the ingredients in the crockpot and mix well. cover and cook on low for 5-6 hours. Garnish with cheese and serve over cornbread or in tortillas. Spray inside of slow cooker with cooking spray. Place onion on bottom of slow cooker: place chicken breasts on top. Combine remaining ingredients and mix well. Spoon cranberry mixture over chicken and onion and coat well. Cover and cook on low heat for 6-8 hours or high heat for 3-4 hours. Spray large nonstick skillet with cooking spray. Add ground beef, onions, mushrooms, and garlic and cook over medium heat, stirring frequently, until beef is browned and crumbled. Drain well. Remove from heat. Add flour, paprika, and soup and mix well. Spray inside of slow cooker with cooking spray. Place beef mixture in slow cooker. Cover and cook on low heat for 6 hours or high heat for 3 hours. Just before serving, stir in sour cream and heat 10-15 minutes, stirring constantly. Serve beef mixture over sliced cooked potatoes. If you want to sugar your strawberries use 1 packet of no calorie sweetener. I’ve read 47 books this year! This does not count books I looked at but didn't fully read which was a lot. I usually have at last 10 or so books checked out from the library that I look at throughout the month like craft and cookbooks an such that I never have time to finish. You can click on the links to read my monthly reviews. This story is about Leah the 2nd daughter of Abram’s 4. Since Abram never had a son Leah took on the duties of a son working alongside her father. She was close to 16 years old when she realized she needed to learn woman’s work in preparation to one day be a wife. She started courting Jonas not long after her birthday and was allowed to go to singin’s. Her father was disappointed because he wanted her to marry the neighbor boy so that they could inherit both farms one day. Her sister Sadie was nearing her baptism and sneaking around with an English boy. Not long after Sadie’s joining the church she discovered she was pregnant and the boy didn’t want anything to do with her. The mother realized she herself was pregnant too which was a surprise at 43. Sadie gave birth 2 month’s early to a boy who was still born. The doctor was the boy Sadie had courted father. They asked him to get rid of the baby so Sadie didn’t have to tell her parents after he left to go home he realized the baby was moving and took it into the house and put it in an incubator. He realized it was possibly his grandson and didn’t know what to do return the baby or put it up for adoption. Leah’s mother delivered a baby girl 2 weeks or so later. Leah and Jonas planned to marry next fall but he got asked by a cousin in Ohio to come learn cabinet making which was a dream come true for him. They made plans for a long distance relationship when he would return in the fall before his families Apple picking season on their farm. Jonas wants Leah to come to Ohio for the last couple months before their wedding. Sadie is troubled by her loss of her baby and beau Lea helps her by sending her to Ohio to stay with the relatives that Jonas is staying with instead of going herself. Leah before becomes a baptized member of the church and tells the leadership of her keeping her sister’s secret of courting an Englisher. Sadie is upset because Leah told and tells Jonah that she saw Sadie with Smithy Gib and later throws a letter away answering Jonah’s concerns as unmerited. Jonas breaks it off with Leah and his family shuns hers. Later Jonas and Sadie get together while Leah morn’s her loss. The family struggles with losing Sadie and her subsequent shunning. Leah’s parents tell her about Aunt Lizzie being her birth mother. Ida asks Leah to raise her children before she dies during childbirth. The family struggles with the loss of losing Sadie to the Shun. Sadie after many years comes home after the death of her husband and asks the community to left the shun so she can be with her family but she have to go thru a 6 month proving period. Mary Ruth mores to town after the death of her beau and become Mennonite and eventually married Robert who becomes a pastor and have a daughter. Gid and Hannah marry and have three children and Gid get elected pastor after one of the older ones dies. Leah’s father and Aunt Lizzie marry and assure Leah she will still be the mamma to her mother’s children. Leah is raising her mother’s children as her own and still unmarried. Lydiann becomes courting age and starts dating Jacob Mast. Leah confronts the doctor who delivered Sadie’s still born baby all those years ago about the possibility of Jacob being Sadie’s natural son and he confesses the whole story. Leah tells Sadie and then they later have to decide to send Jacob to Ohio. A group of boys are being trade amongst the two Amish communities because they are concerned about too much intermarriage deformities and what fresh blood. Lydiann and Jacob are Aunt and Nephew even though they don’t know it. Jacob goes to Ohio and apprentices with a master carpenter who ends up being his brother Jonas. Jonas goes home to find out what happen to Jacob and reunites with Leah and promises to get the shun lifted. After Jonas return he is reunited with Leah. Leah and Jonah plan their fall wedding as they enjoy their courting time. It is told to Jacob and his family that he is actually Sadie’s son that she thought was stillborn. Jacob’s father throws him out of the family house after finding out this news because of his feud with the Ebersol’s. Jonah and Jacob move in with Eli until matters can be worked out. Eli and Sadie being to court and eventually decide to marry in the fall after Jonah and Leah. The Mast and Ebersol’s end their feud after Leah saves John’s life when he gets drunk and his buggy is running lose.